PIA 19702 seems to show distinct planet wide separation and adjustment spreading of the brighter masses. This pattern follows the equatorial complex repeat patterns as a system of motion and adjusted surface features , giving an impression of plate tectonic type movement. Is the appearance a true planet wide system and does a primarily water ice surface qualify as a tectonic structure? Is the exposed surface actually ice as estimated recently? Open to discuss any New Horizons aspects, and the Pluto/Charon moon group generally. Some supportive information for the suggestion that a spreading broad surface set of features resemble plate tectonics in active formation. Below is a recently released Earth/ocean tectonics gravity mapping result, to give reference to the distinction between active plate tectonics and simple surface ice motion. 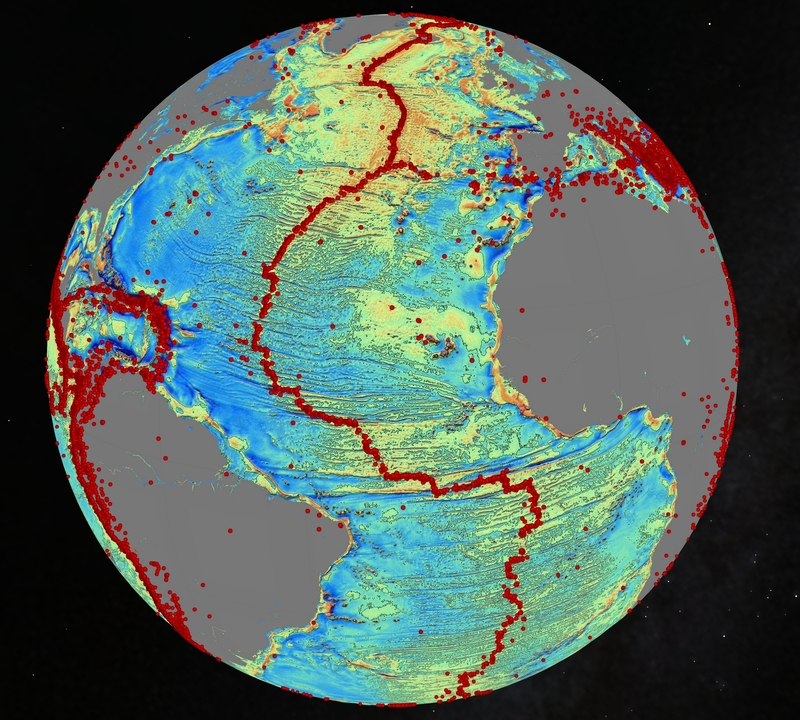 Earth/ocean mapping from the ESA presentation of the CRYOSAT mission results, which were used to map both ice and solid seafloor details. In the resulting improved maps some of the largest continental river systems are clearly shown as spreading center by-products. We are accustomed to seeing the patterns of surface motion in solids as widely separated land/ocean border margins with residual matched shapes. Other images of the Pluto system are from the Photojournal and the New Horizons mission site pages. I will present an adjusted view of Pluto from the first topic entry image, which may show a clearer view of the detailed surface motion that has occurred at some time on Pluto, and which has not been erased or altered by more recent events. To my understanding the shapes are not a rise or subsidence of regional surface patterned ground or ice, but a motion based change of positioning. Any challenge to the presumption I am making? 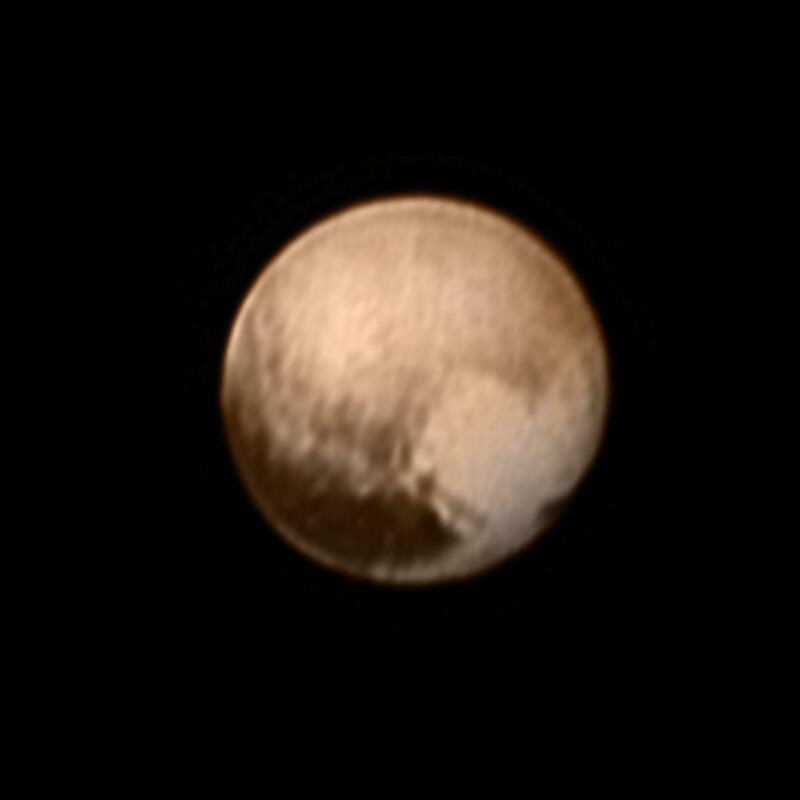 First topic image from New Horizons, reduced to half size and altered substantially. Reduced to 16 tones, color reduced, lesser contrast. This shows only a limited view at one angle, with expected declining brightness around the disk margin, but it does show also a apparent matching of margins, possible faulted motion recorded, a equatorial change of the dichotomy of hemisphere areas, and other apparent records of active geology or ices, with series or deep fault/adjustment changes in patterns. The best views of the details are just a days wait, so now is the time to begin assessing the few available images. Perhaps I am reading too much into a single low resolution view. As the pass-by becomes history, so the facets of mystery about Pluto become a window in active geology processes recent or on-going. Hope this first closeup shows the active facets of geology not expected by many. Even Charon has an active hemisphere/hemisphere surface set of features to study and understand. I altered this small area of the close-up to show the deep 'rilled' flow or gully/layering type pattern which gives the impression in this image of a flow movement at some time. Actually most all of the mountainsides are of this appearance in varying degrees across this full image. Steepness and vertically oriented gully-like incised patterns dominate the slopes. The image here is the same as entry #4. Unfortunately I selected a smaller version of the image and to show details I have enlarged the image to 2X, with DPI at 144. The still has been rotated counter-clock-wise about 35 degrees, to give a vertical orientation of the two sections marked by a white border. The two sections are both active in very similar aspects, yet are two separate features, similarly spaced apart from the transecting fault movement linear feature along the center of the image. Each of these active areas involve left and right side actions producing some degree of symmetry of activity about a central linear axis. The two sections are not influenced by visible cratering, and are some of the strongest evidence of a common process of spreading or transform faulting and movement which is oriented to the lower right to upper left major fault. Both of these active sections show a very unusual common process, despite differing activity otherwise distinguishing them. They each have a counterclockwise rotational motion recorded in the dual or axial paired features visible. In each, the items on the left are elevated upward, having been in movement from a common source during separation from a central source. Items on the right are lower in relative position therefore, and the masses of flow material, and stresses recorded in surface margins and minor scarps and flow margins are all showing a circulation in counterclockwise direction about each center/axis. Even the hills and depressions along the primary diagonal fault between the two marked areas show a similar torqued offset along sections to the left below the fault line, and corresponding offset to the right above the fault line. The surface and at depth was in circular rotation 'in masse' in a same directional pattern for each, with the fault accommodating the difference in stress with a release of position at sections of the fault. Other sections of the fault do not show much offset. At the upper marked area, even the opening chasm along the top of my white line, shows the left is inside the box, and the right side extends beyond my white line, placing that portion outside my box. While these small details seen not significant as single items, all aspects of these two boxed action zones show all features follow these circulation directional offsets and recorded movements. The upper box shows apparent paired rifting separation about a center and an axis, and the lower boxed zone shows two flows from a center and an axis. Both axis lines are approximately parallel, and are perpendicular to the main diagonal fault. Alignment of mountains is clear in the full frame image, tilt is similar for most all sharply angled mountains, and even the 'rolling hills' as active ropy vortex type patterned terrain has a same matching rotational character along low angled slopes as the vertically aligned counterclockwise rotation of the boxed main features. In these details I may only describe motion locally, and vague similarities to standard Earth tectonics processes of transform faulting, spreading/rifting activity, and ocean basin geology we know as common on Earth, but it is important to count the totals for a final description of the minor planet system of motion and activity as a possible analogue to Earth processes. This is a link to an MP4 movie released by NASA and co-working research associated groups on July 15, 2015. The image of Pluto clearly shows a section of the active geological linear dichotomy zone with the video close-up indicating the still image of July 14, 2015, used in this topic introduction entries, is located at the bottom central area of the full view of Pluto. 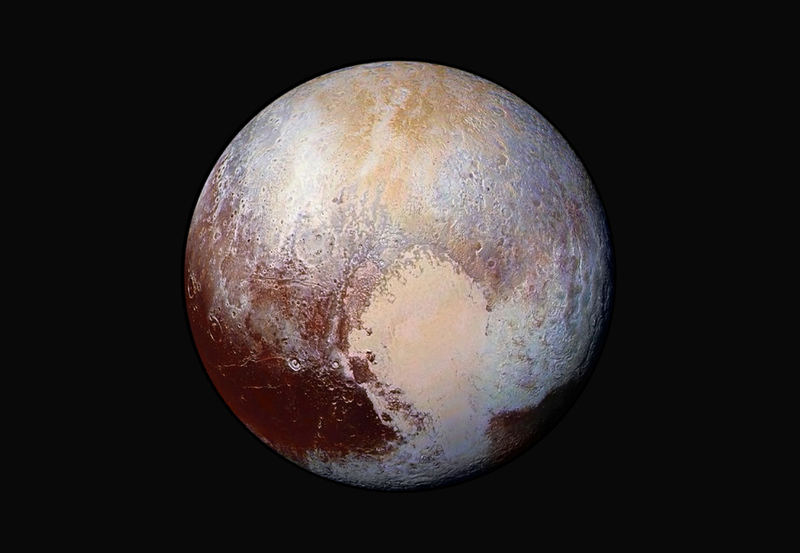 This places in near the lowest point of the 'heart' bright shape now named Tombaugh Regio. The image area is near the crossing of two massive linear slightly angled intersecting margins of the bright versus dark dichotomy feature which surrounds most all of Pluto. Details I show in my marked version may be explained by the intersecting of the dichotomy formation, either at the causative events timing, or over time during the subsequent developing differentiation of the b right and dark zones. Curiously the mission investigators stat that these features I am marking are probably no more than a 100 million years old. If these aspects of the bright/dark dichotomy zone are characteristic of the entire length of the main Pluto feature, can it be that all of Pluto is active along the equatorial zone? This additional NASA image of Pluto which shows the intersecting two angle formation at which the close-up image was taken. As I understand it, the image is located at the lower portion margin just to the right of the precise intersect. Here I made a crude estimate of the close-up image section, marked in yellow. This may be easier to view than several stills and a movie. I suggest all links for a better understanding of the causes of activity and the peculiar details I describe. Are there other aspects of the returns which show patterns or which may give clues to the cause for an active geology on Pluto? Feel free to be corrective of my information, images, or suggestions. "In each, the items on the left are elevated upward, having been in movement from a common source during separation from a central source. Items on the right are lower in relative position therefore,"
In the entry #5 I have made a serious error, reversing the relative motion of items and material. In a counterclockwise direction, objects will be moving or positioned with right side elevated relative to the left, the left side items therefore lower in position to those on the right. My observations are correct, my description was flawed in my statement in the first paragraph of entry #5. If these items match expected rotation for coriolis patterns on Earth, should we expect the same forces are at cause in a ice or solid chemical 'soup' which has clearly formed the massive ropy 'rolling hills' structures surrounding these circulation features mixed with the steep angular mountains? Is a shearing grazing impact a possible cause for all the details, and is the direction of impact a cause of the directionality of mass and ropy flow vortex shaping? Is a magnetic or other force possibly a cause for massive correlated vortex formations? Pole to pole feature variations have formed on Pluto in large number, expressed primarily at the equatorial region, and along the northern hemisphere. Is this matching to both Earth and Mars gravity patterns we have viewed in satellite returns? Can the tectonics effects we see on Earth, matching the pole to pole gravity offset variations we see relating the Earth plate tectonics earthquake activity zones to gravity offset zones, be at work on a minor planet smaller than our Moon? Perhaps some combination has increased the susceptibility factors to give Pluto an active geology? A different view of the area is boxed in yellow, not precise. The green zone is relative amounts of Carbon Monoxide measured close by. The feature on Pluto known by the common description 'the heart', has a easy to understand place in the geological history of the minor planet, and may aid in the establishment of the timeline of major activity both recent and ancient in geologic timing. This is a anigif of two images, one the original issue as seen in entry #7 just prior, and the second image a rotated frame turned counterclockwise 110 degrees and offset to overlap the strongest section of the 'heart' shape above and at the angle of the lessor bright and less well defined lobe of the 'heart' shape. As the minor planet has an axis altered by a range of 102 degrees to 122 degrees over time, from a vertical solar ecliptic plane( or a off angle Pluto inclination orbit approximation of that solar system standard), I have taken an 'adjustment' of a mid range figure for correction, and applied the change of angle to a counterclockwise rotation of the minor planet body, giving a near perfect overlay of the two lobes of the 'heart; shape, as a single item feature at what could have been a single period of time, a repeated series of timings, or, a catastrophic tilting influence with similar incident timing. The two images are timed at 3 seconds each. Someone might want to use different software to show the rotation of 102 to 122 degrees as a local event, with better technique, but I believe this shows the basics of a system of two features related by the parent body tilted in a periodic range, and tilted from the original angle of a vertical axis (following the other solar system main orbital 'planets' expected orientation). The systemic tectonics is a partial result of the point of a change in axial tilt for Pluto, and the concept that the tectonics system may still be active from the timing intrigues me. The match of a counter-clockwise rotation for each of the large features I have presented in the first few entries, added to the major cause indicated by the 'heart' shape being a two lobed object relict which occurred during the parent body tilting from it's original axis, gives a explanation for the large masses being active and having a relict torque applied which would motivate motion of such a large energetic type. The fact that the areas were each separately in motion in the same direction as the axis tilt change, might give a timing for the change of Pluto's axis orientation. Does the presumption seem reasonable? False color image of Puto released which combines the LORRIE and RALPH instrument early returns. An enlarged 2x image copy, at dpi 288, to allow a clear view of an interesting elevated, and separated near circular structure which may have former central cones, at varied timings. The massive separating depressed formation appears to indicate at this portion of Tombaugh Regio, or the margin of the former prior location of this ice region, one of two or more elevated structures with central features appearing similar to sheild volcanic shapes, with slopes and raised outer margins elevated above the surrounding terrain. The yellow circle I have added to the NASA images shows the approximate shape of the singular item now separated and possibly slightly offset in a counterclockwise pattern, similar to the offsets in the smaller features I presented in entry #5. As there is an incremental release of basic information underway by NASA, related groups, and professionals, I am adding only details not yet presented by those professional groups. Perhaps later I will be required to correct my information if I am contradicted by better instrument release details, or by more experienced interpretations. The current claims of ice 'flows' which are active, recent, and 'tectonic activity' of both ancient and recent surface features are an interesting 'switch-around' of basic explanations of Pluto features versus the past ten years claims of Mars features as 'fixed' and 'inflexible and inactive due to extreme cold'. A YouTube version of a discussion of the most recent science presentations discussing ice flows, active snow, and active tectonics adjustments. (at the red dot) gives the least irradiated and probably the coldest lighted margin of the zone of rough terrain. The apparent activity of air or direct physical migration of sublimed or 'snow' ice leaves a rough surface set of features, covered in a bright layer, which may or may not include a matching subsurface ice content in the older rougher terrain. The bright right lobe current position appears tied to the orbital and axial tilt of the minor planet. I am waiting for the professionals to predict whether the bright lobe portion of the ices will follow the shadow hemisphere late day darkness margin as the orbit proceeds over the next century. Also the longer term tilt variation may be tied to the deposition of the ice shape, and may be more influential in the accumulation or loss of both right and left portions of the 'heart'. A image defining location names informally for varied terrain locations on Pluto. I will try to use these names in future entries, until other names are established. 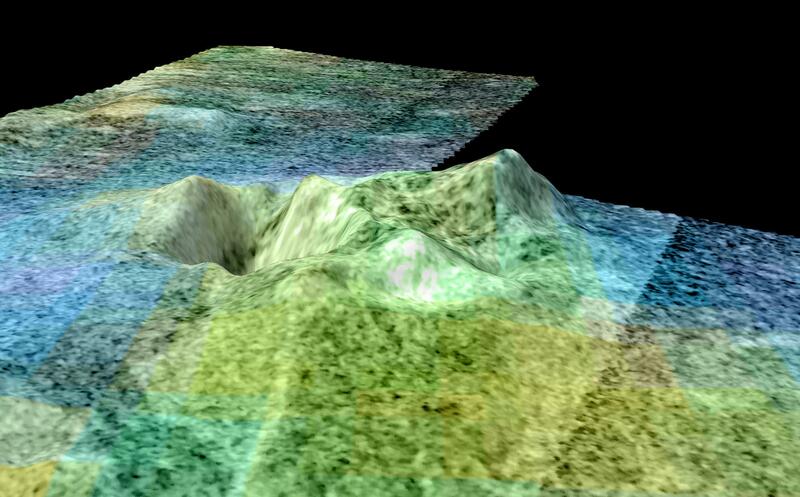 The location of the apparent elevated structure only partly recognized as yet in the naming scheme is known as al-Idrisi Montes, the left-most and upper reach of the blue colored terrain series of features along the margin of the deep ice bright area. The blue sections are arched along the margin and are the noted active zones of tectonic and recent surface movement in recent science releases. My entries concern these sections, and the active tectonic feature along this arc is not yet given a name as a single feature. Clearly the area I have discussed, from Norgay Montes, to al-Idrisi Montes is a former active single structure of tectonics oriented mountain ranges, vortex or circulating massive surface movement of some undetermined timing, and a spreading or deep erosional movement of surface materials. The remaining former active area in my observance of the feature between Burney Crater and Tombaugh Regio, is not selected for a name, yet it is clearly distinguished in the map image here. Hopefully they will release a name for the left portion of the nearly circular feature which is broken into left and right(al-Idrisi Montes)sectors by the as yet unnamed tectonics arc. These observations were the reason recent space missions were to be open access for the public to contribute content to provide inclusive detailing of a massive project of interpretation. Perhaps we will have a later program of public study allowed for the image content. We have public blog, forum and website availability prior to the naming conventions. magma type upwelling, rather than the standard view of a linear formation of heat and flow through spreading rises. While we cannot expect Pluto to match Earth tectonics in detail, the concept of a 'rotation' of rising material is a normal process in addition to transform offsets, and can be understood as one of several accommodations of material at depth for most any active planetary body where motion and force are applied through resistant materials. A view of the two rotated areas from my entry #5, seen here in a new Google Earth early Pluto map available for download. The imagery is the same as early photo releases, but in only half the resolution as the originals. The two areas still show rotation even after the adjustments of image orientation. I have aligned the main fault vertically, approximately northward, set where the 'Data' type occurs beginning at the bottom of the image. This angle of view shows the substantial offsets of the landscape details, most noticeably the mountains and hills. 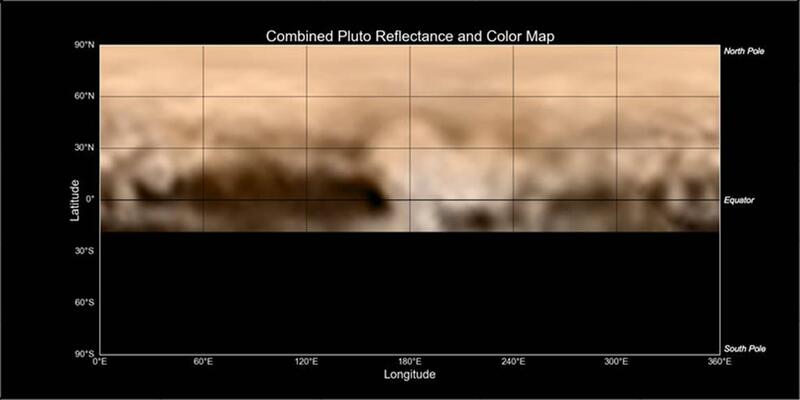 This is a link for the new Pluto map image which integrates with Google Earth automatically upon installation. Hopefully we can find all the better detail map images of Pluto on Google Earth once they are released and converted to KML files. Image credits found on image. I find this fault interesting as it shows a possible analogue to the Earth and Mars gravity stress zones which relate to and overlay the Earth tectonics earthquake prone movement areas in the case of the Earth based satellite information. Can this be the first indication of plate tectonics type land/ice movement on another planet? Perhaps it is not a north/south alignment accurately, and only my imagination/ambitions? The link for the JPG image I promised at #12 above. I will provide a marked image for the two areas soon. A view of the new Pluto overlay on the Google Earth globe, giving an overhead satellite view of the fault with landform offsets and the several areas of rotation around the left and right sides of the major fault. The fault is marked with a yellow/blue directional arrow. The fault direction closely matches the South Atlantic rise spreading zone in the image. The minor stress ridges or textural landscape patterns in the Pluto image also match the Atlantic Earth patterns. Motion on Pluto in small areas as rotational offsets have caused fault offsets of landform details in large scale here in the images, and could possibly be explained not as an impact/bypass occurrence but as deeper stress accommodation of complex tectonics activity. Does this allow consideration of pre-plate tectonics formation and movement? A view of the south Atlantic Ocean in Google Earth, with the vertical aligned relative position of the fault marked as a small rectangle, pinned in my Google Earth. The inset of the rotated and offset landforms includes a third example in the upper far left of the left side white box, giving three examples of slight counterclockwise rotation of major mountainous and tilted active areas. All the three examples seem to be spreading along a center alignment for each, at some timing. There are minor faulting along interaction margins for the examples, and the offsets along these faults show the rotational or directional stresses, with each area of landscape in motion relative to the others. Are these sufficient examples to indicate a parallel to Earth type spreading ridges and plate tectonics motions in ice based landscape with major mountain building and faulting aligned with the axis of a planetary body? The several faults and active tectonics type apparent records along the continuous margin of the bright ice feature on Pluto designated the 'heart' informally, shows similar features of spreading or motion, and follows the basic pattern of Earth active spreading. Does that also qualify a match in deeper processes? I uploaded several animated GIF images marking the apparent elevated or outline obvious areas where the ice deposits or other previously active geology eruptions or possible surface deposition additions to the features were recorded by outlines and added material content. Despite the lack of knowledge about the activity recorded by these apparent positive relief zones, the cratering and fissures through these areas has not eliminated the noticeable outlines, and they do not appear as impact craters. They appear as old structures with a reasonably flat overall level, similar textural character across each area, and similar to the Mars base polar deposits which consist of ice/solids residue built from an ice cap in motion and under influence of weathering. I believe these are a record of the movement of the cause of the current visible ice area known as the 'heart', or Sputnik Planum, in Tombaugh Regio, and caused probably by the reorganizing of the current cause of localized ices as seen in the current location. Due to some peculiarities of the photo host limits I encountered when uploading these images, I have been required to reduce the size of the images, and reduce the number of total frames in the sequences. Only some of the total marked partial outlines are seen in these anigif's. Each sequence is different in number of frames, and each is a differing size. Some cratering is recognized across the region by professionals and there are names applied to a few of the smaller spots where craters are claimed, but none of these outlined circles and ellipses are named or recognized currently as impact spots. Perhaps you con find a alternative cause for each of the marked areas other than a former core of ice buildup or ice eruptions? Is this a Pluto/Charon resonance or singular interaction record based upon a close or grazing encounter? Possibly this matches the Pluto axis cycle of tilt variation? This does seem to match a linear record, and matches somewhat the possible cause for spreading and rotational character of the small areas in Norgay Montes which I have presented in the prior entries of this topic. Is this described in research as yet? Is this similar to volcanic or cryo-volcanic activity added to the current ice concentration content, perhaps caused by the stresses resulting in the main north/south fissure without requiring a transfer of the massive ice seen currently? As these area margins overlap, surely this is a singular process record. Some of these marked features appear quite elevated with apex craters, or peaks, and they are aligned with the main fissure tectonic feature. Each of these only a slight variation of the other, yet I thought the confusing inclusion of features small and large, was unresolved as to cause and reasonable predictable patterns both of the satellite moon Charon and geological causes. There is also the problem of the orbital exposure of sunlight which has a period of hundreds of years, causing probable migration added to axis tilt variables. The anigifs are active if you include them in a browser address box, by typing or Ctrl > C & Ctrl > P (C&P). When will we have anaglyph's of Pluto for 3D viewing? If you use this image host service, beware; do not try the right click context menu selections while an 'uploading' page is open, as it will lock up the Internet Explorer pages, requiring careful closing of all but the main hosting page. This is possibly an Apple based host server somewhere. Only very limited access to the source host site is available currently. It could be a very fine hosting service, but the limits on file and image size are not accurately presented, and no feedback or editing is being allowed. A still JPG view of the anigif marked area of influence, as the anigif's do not show thumbnails on this blog. Included at full size here, 2000x1125 pixels, reduced in frame size in the links above. This image composite is credited below, and the description was written prior to my additions of the yellow markings. The active area I have been discussing is located approximately opposite the Charon position. The yellow boxed active tectonics zone is visible opposed to Charon. The tidal locking of the two in a mutual face-locked orbital spin places Tombaugh Regio on the far side of the mutual orbital center-point. The center-point occurs beyond the surface of Pluto at a position in space. The effect of the interaction seems to have been one of the reasons for the 'heart' orientation on the far side of Pluto away from Charon. The Pluto equatorial periodic zones of bright and dark patches is nearly facing the closest locked side of the Pluto/Charon pair which in this image would place that area out of view. I am attempting a partial reply here as I have been prevented from making a full statement. Some reference to 'illegal characters or UTF-8 characters'. I try to find the problem, and post an additional explanation later. Observing the 'flyover' of Sputnik Planum presented by NASA on You Tube yesterday, I viewed what many have seen I am sure, a medium sized 'crater' with rings on the ice. As that seemed odd, I have enlarged an initial view, added contrast and other changes, and found a slight eruption quality in the upper air rising from the crater. This may be pixel distortions, but the remaining area shows little of coherence in shaping a 'inverted cone' above any other objects and no other craters. Possibly real or possibly to few pixels? Found in the far right of the video at 8 to 10 seconds into the viewing. As they have been using techniques to prevent addressing the videos other than on You Tube, I'll study this and add sources for everyone later tonight or tomorrow. Please study this and give some feedback. The possible releases from the crater/cone on the ice of Sputnik Planum seems to be substantial despite the very low contrast of the original video imaging. The crater core is less than two pixels diameter, appears to have a very bright core, in fact it has the brightest white tone in the local area by far(about 10% brighter). The appearance of rising gases or perhaps a flowing liquid from a breached wall, shows in all altered and distorted image changes. The material causes a disrupted loss of detail, and slight changes in the darkness above the bright cone-like core of the crater/cone. Hopefully the view will be aided by subsequent images as they are downloaded from the New Horizons spacecraft. The crater appears at the lower right corner of the video, at about 8-10 seconds into the flyover. Here it is shown marked in yellow from a captured still frame. This is the appearance of the low resolution and low contrast original video. A anigif series of highly altered views of the emissions or flow, enlarged about 8X and the dpi shifted to 576. In the transfer to an image host and repeated downloading you may lose the dpi and some resolution, but GIF's are relatively stable I believe, and the altered views all show similar changes of the background tones and coloration in the rising or flowing path. Does this actually represent a gas, liquid, or solids combination eruption or emission? Is this unique, or related to the series pits along the troughs? Are these similar to Mars fans, 'black smokers', or organics, ice, or mantle chemistry eruptions from tectonics stresses or hot plume type rising subsurface material? As this is along the fault active and heavily eroded/altered landscape of the Sputnik Planum, is this not a possible meteor impact scene, but internal ongoing active geology? A JPG of the anigif for reference. The video links promised in the prior entry. This view of the far right of the video is a 4 second delay sequence of 8 variations of the ringed crater/geyser possibility feature. The sequence includes positive original screen capture, negative high contrast, positive 'auto' adjustment, 8 tone contrasty negative, 16 tones contrasty negative, and repeats of similar altered views. Hopefully this at only a 2X size increase, and at 72 dpi as the original basis of view, will give those skeptical of altered images some confidence that nearly all details remain present and reasonably the same throughout alterations. An interesting circular light toned spot on the far left of this view has an apparent drainage streak arcing up and counterclockwise, differing from the far right more obvious emission dark upward cone or cloud type shape. I believe the far left item appears more a drainage liquid or more likely ice or solids feature, whereas the far right dark feature above the crater/cone may be an air suspension emission. Many of the features seen here show transparency and overlay details beneath, giving a contrast to the apparent two flows which give an impression of opaque or haze disruption with tonal changes. Some of these dark pits in the original unaltered images show a directionality as elongation, seeming to be angled with the erosion and probable wind direction tendency, away from the north pole, and slightly west(west is left side looking to the north- this video is oriented southward, so the trend would be to the right slightly). A view at a size of 1120x554, about 140% increase, the same anigif, 8 images, 4 seconds. Cryo-colcano activity detailed on Titan in this You Tube distributed video from, JPL/NASA at the source. A source page with links for stills and the original movie. These are so similar to the several examples I had selected from the first detailed image released of Pluto at Norgay Montes, that the materials involved would be my suspicion for a variation in cause and effect on Pluto. Clearly the Titan example has a fault based activity associated, with a spreading of two lobes along an axis. The smaller flows remaining visible on Pluto may be a result of lessor initial semi-fluidic or gas activity, or may be caused by erosion as we see around the icy bright nearby feature in Tombaugh Regio. Some flows are apparent near the three examples I presented in images at entries #4,5 and #12,13,14. A link to Titan basic information concerning cryo-volcanism and similar chemistry. Several pages long and well organized and easy to read. Titan. (2015, August 16). Wikiversity, . Retrieved 19:32, August 16, 2015 from [ https://en.wikiversity.org/w/index.php?title=Titan&oldid=1412076 ]. Hopefully this set of brackets around the active https link will solve the 'illegal characters' error from prior entry attempts which failed on this blog. The link can be accessed with highlighting of the link only, excluding the brackets. A global position view of Sotra Patera, formerly Sotra Facula.